150 Commonwealth is located on the south side of Commonwealth, between Clarendon and Dartmouth, with 148 Commonwealth to the east and 152 Commonwealth (287 Dartmouth) to the west. 150 Commonwealth was designed by Peabody and Stearns, architects, and built in 1880 by Woodbury & Leighton, masons, and Andrew Anderson, carpenter. It was built for the estate of Richard Baker, Jr., shown as the owner on the original building permit application, dated December 17, 1879, and the final building inspection report, dated December 30, 1880. 150 Commonwealth was built on a 20 foot wide lot purchased from the Commonwealth of Massachusetts on August 13, 1870, by Jarvis Williams. That same month, he also purchased a 38 foot wide lot to the west from the Commonwealth, where he built his home at 152 Commonwealth, leaving the the lot at 150 Commonwealth vacant. Click here for an index to the deeds for 150 Commonwealth. Jarvis Williams died in November of 1870, and on June 3, 1871, shipping merchant Richard Baker, Jr., purchased both properties. He and his wife, Ellen M. (Whittemore) Baker, made 152 Commonwealth their Boston home. They also maintained an estate, Westcliff, in Newport. Richard Baker, Jr., died in January of 1875, leaving 152 Commonwealth and the lot at 150 Commonwealth in trust for the benefit of his wife and their children. Ellen Baker continued to live at 152 Commonwealth. After 150 Commonwealth was built in 1880, it was leased by the Richard Baker estate to others. By the 1881-1882 winter season, 150 Commonwealth was the home and medical office of Dr. Orlando Witherspoon Doe, a physician. He previously had lived and maintained his medical office at 1 Union Park. He was unmarried. From about 1887, Dr. Doe was joined at 150 Commonwealth by Dr. Samuel Breck and by Dr. Allen Melancthon Sumner and his wife, Ellen (Prescott) Sumner. 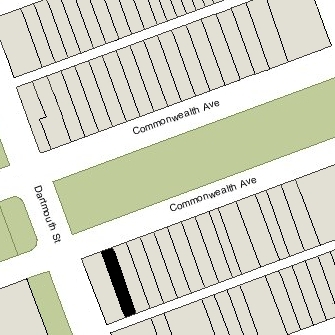 The Sumners previously had lived at 76 Commonwealth. Both Dr. Sumner and Dr. Breck were physicians and maintained their medical offices at 150 Commonwealth. Samuel Breck was married in January of 1889 to Louisa Maria Eddy. They continued to live at 150 Commonwealth, with Dr. Doe and Dr. and Mrs. Sumner. Orlando Doe died in December of 1890. 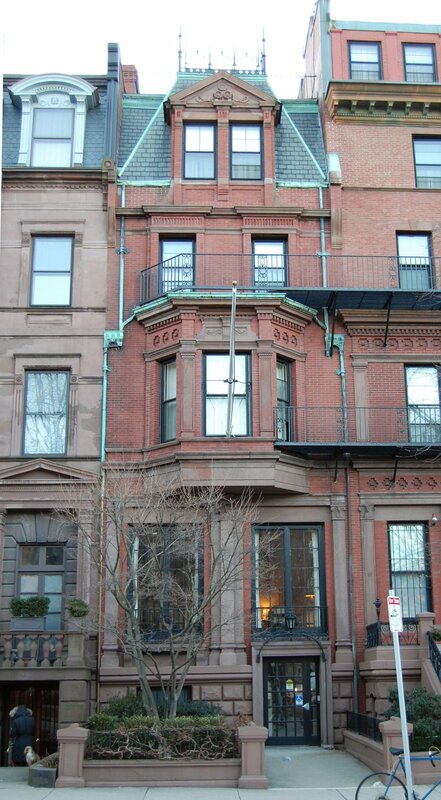 After his death, the Brecks moved to 122 Marlborough and the Sumners moved to 336 Beacon. 150 Commonwealth was not listed in the 1892 and 1893 Blue Books. By the 1893-1894 winter season, 150 Commonwealth was the home of Frank Morison, an attorney and former state legislator, and his wife Leslie G. (McGregor) Morison. They previously had lived at 44 Chestnut. The Morisons’ three children — Isabel Morison, Leslie McGregor Morison, and James McGregor Morison – lived with them. In his memoirs, One Boy’s Boston: 1887-1901, Samuel Eliot Morison (Frank Morison’s nephew) describes his Uncle Frank’s decision to move from Chestnut Street to Commonwealth Avenue: “When Uncle Frank Morison decided to move from unfashionable Chestnut Street to swell Commonwealth Avenue, his son James MacGregor, known as ‘Mac,’ burst into tears, crying ‘There are ten good reasons not to leave Chestnut Street.’ When invited to name them, Mac said, ‘The first is the coasting – and that goes for the other nine! '” (Coasting was sledding, a popular sport on Beacon Hill). Frank Morison died in December of 1894. Leslie Morison and their children continued to live at 150 Commonwealth. She also maintained a home at West Beach Hill in Beverly Farms. Leslie McGregor Morison married in October of 1904 to attorney Clifton Long Bremer and they moved to 37 Mountfort. Isabel Morison married in June of 1908 to attorney Frank Washburn Grinnell and they moved to an apartment at 409 Marlborough. During the 1907-1908 winter season, Leslie Morison was joined at 150 Commonwealth by Clifton and Leslie (Morison) Bremer. Their primary residence was in Cohasset..
James McGregor Morison continued to live at 150 Commonwealth with his mother until about 1910, when he moved to 20 Ballou Place in Dorchester. 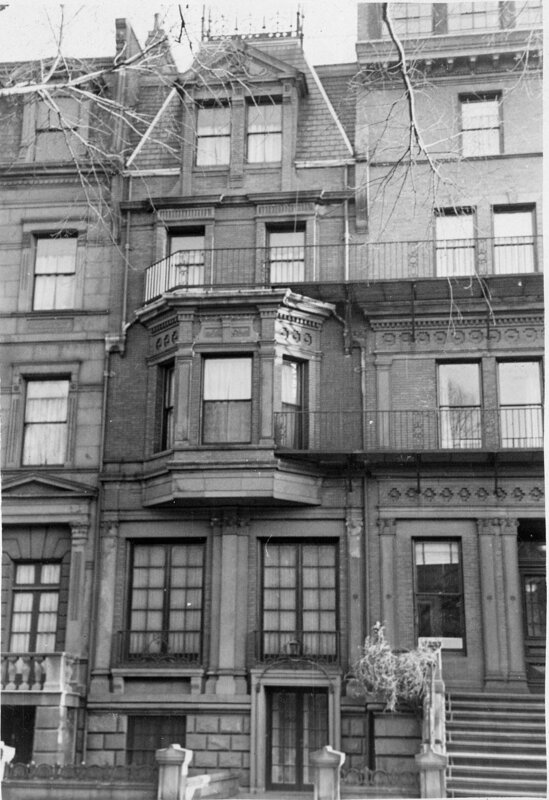 Leslie Morison continued to live at 150 Commonwealth during the 1910-1911 winter season, after which she moved to 86 Commonwealth. By the 1911-1912 winter season, 150 Commonwealth was the home of Thomas Sherwin and his wife Isabel Fiske (Edwards) Sherwin. They previously had lived at 10 Revere in Jamaica Plain. Thomas Sherwin was President and later Chairman of the Board of the New England Telephone and Telegraph Company. He had served as an officer in the Civil War and was brevetted a brigadier-general, U. S. Volunteers, for gallantry at Gettysburg and for meritorious services during the war. The Sherwins’ unmarried children lived with them: Thomas Edwards Sherwin, Robert Waterston Sherwin, Anne Isabel Sherwin, and Edward Vassall Sherwin. Thomas Sherwin died in December of 1914. Thomas E. Sherwin, treasurer of a mining company, married in September of 1915 to Emily Louise Blodgett. After their marriage, they lived in Lincoln. Robert Sherwin, an engineer with New England Telephone and Telegraph, married in September of 1917 to Constance Welsh Perkins. After he completed his war service in the US Army, they settled in Albany, New York. Isabel Sherwin continued to live at 150 Commonwealth with Anne Isabel Sherwin and Edward Sherwin. In 1919, they were joined by her daughter, Eleanor Goodwin, widow of banker and note broker William Hobbs Goodwin, Jr., their children, William, Isabel, and Eleanor Goodwin. Isabel Goodwin married in October of 1921 to Robert McAllister Lloyd, Jr., and Eleanor Goodwin married in June of 1925 to Francis Hathaway Cummings. William Hobbs Goodwin, III, continued to live at 150 Commonwealth. In January of 1925, 150 Commonwealth was purchased from Richard Baker’s estate and heirs by Pauline (Revere) Thayer, the widow of Nathaniel Thayer. She lived at 22 Fairfield and in Lancaster. Pauline Thayer was a founder of The Chilton Club located at 152 Commonwealth and served as its first President, from its founding in 1910 until her death in September of 1934. She purchased 150 Commonwealth on behalf of the Club, and on May 28, 1926, the house was acquired from her by the Club. The Sherwin family continued to lived at 150 Commonwealth until September of 1926, when their lease expired, after which they moved to 169 Beacon. In September of 1926, the Club applied for (and subsequently received) permission to remodel 150 Commonwealth, including lowering the front entrance and making various interior modifications to consolidate it with the Club’s property at 152 Commonwealth. The plans also included adding a rear ell which subsequently was was not built. The work was designed by William Bigelow of Bigelow and Wadsworth. 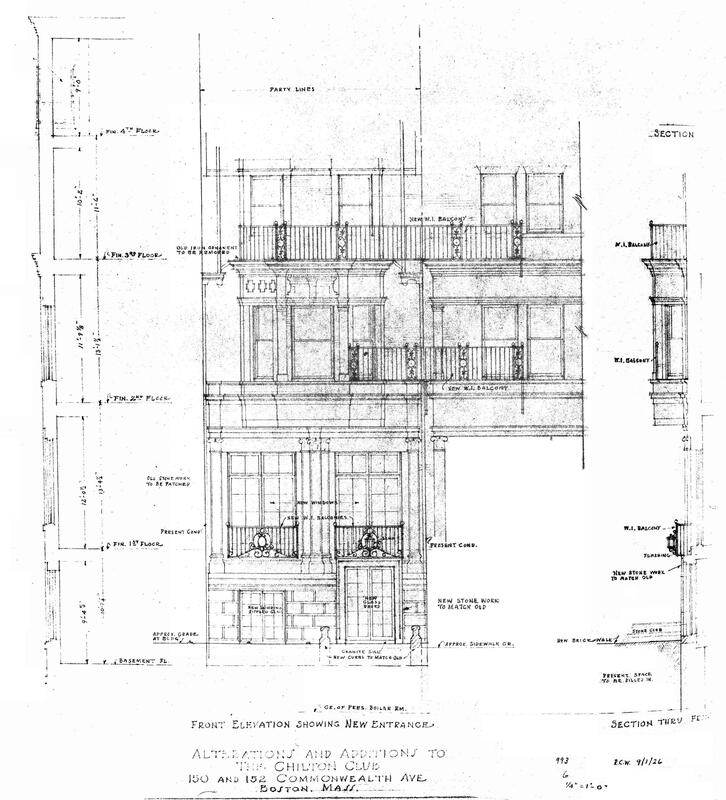 Plans for the remodeling — including elevations and floor plans — are included in the City of Boston Blueprints Collection in the Boston Public Library’s Arts Department (reference BIN P-24). 150 Commonwealth officially opened as part of the Chilton Club in 1927. Architectural rendering by Bigelow and Wadsworth of lowered front entrance of 150 Commonwealth and associated remodeling to combine it with 152 Commonwealth, September 1926; courtesy of the Boston Public Library Arts Department.